Photo/Spec's/Features Luxury 2008 280FQ 29'5" 7245 $37,869. $ 7,107. $30,762. Blue 'Year' = Custom Order New For '07 What Can You Tow? WARNING! Photo/Spec's/Features Deluxe 2008 180W 23'11" 3750 $18,700. $ 5,705. $12,995. Photo/Spec's/Features 2008 180W 23'11" 4180 $18,700. $ 6,705. $11,995. Photo/Spec's/Features 2008 190W 23'11" 3750 $19,300. $ 6,301. $12,999. Photo/Spec's/Features 2008 241W 26'7" 4400 $24,300. $ 8,305. $15,995. Photo/Spec's/Features 2008 250W 29'11" 5600 $25,000. $ 5,005. $19,995. Photo/Spec's/Features 2008 171 20'4" 3375 $18,300. $ 5,307. $12,993. Photo/Spec's/Features 2008 228 20'5" 3250 $21,400. $ 6,625. $14,995. Photo/Spec's/Features 2008 253 26'11" 5050 $26,000. $ 8,005. $17,995. Photo/Spec's/Features 2008 262 29' 5900 $26,000. $19,995. Photo/Spec's/Features 2008 264 26'8" 4910 $26,000. $ 8,005. $17,995. Photo/Spec's/Features 2008 268 28'11" 6175 $30,500. $10,505. $19,995. Photo/Spec's/Features 2008 272 28'9" 5875 $28,200. $ 9,205. $18,995. Photo/Spec's/Features 2008 278 31'5" 5225 $32,500. $12,505. $19,995. Photo/Spec's/Features 2008 291 34'2" 6400 $28,500. $ 8,550. $20,995. Photo/Spec's/Features 2008 292 32'6" 5875 $32,500. $11,501. $20,999. Photo/Spec's/Features 2007 2960 32'3" 6275 $33,500. $12,623. $20,877. Photo/Spec's/Features 2008 4085* 39'0" 8050 $45,000. $13,500. $31,500. Photo/Spec's/Features 2-bd-rm. 2008 3986* 39'10" 8925 $52,000. $17,005. $34,995. The mid-size travel trailers, in the 18-24 foot range, tow easily behind properly equipped full size cars, and are a pure pleasure when towed behind a van or pickup truck. With interior facilities depending largely on the size and cost of the vehicle, the travel trailer category opens up at around $13,000. 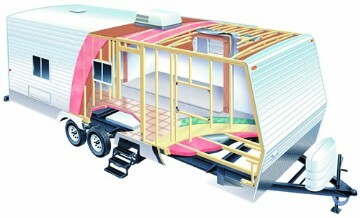 and averages about $25,000.00 for a mid-size unit. Sleeping capacity varies with size, but trailers typically accommodate six to eight adults in comfort, and contain full kitchens, bathroom facilities, and the comforts of a pressurized hot water system with shower stall, of course. Brown's RV stocks these Lite Travel Trailers: Aljo Model 190LT, Aljo Model 225LT, Aljo Model 239, Aljo Model 250LT, Aljo Model 259LT Brown's Recreation Center stocks these Standard Travel Trailers: Aljo Model 2670, Model 2680 Aljo, Model 2760 Aljo, Model 2940 Aljo, Model 2960 Aljo, Model 2980 Aljo, Model 3150 Aljo. Also, Aljo Model 198 Limited, NOMAD Model 247 Limited, Aljo Model 300 Limited. Brown's RV stocks these Fifth Wheels: Aljo Model 2405, Aljo Model 2705, Aljo Model 2805, Aljo Model 2905,Aljo Model 2715, Model 2805 Aljo, Model 2905 Aljo, Model 3005 Aljo. Brown's RV stocks these Toy Hauler Travel Trailers by Skyline: Aljo TrailRider Model 199 Way -Lite, Aljo TrailRider Model 219 Way -Lite, Aljo TrailRider Model 240 Way-Lite, Nomad Rampage Model 217 Way -Lite, Nomad r Model 260 Rampage, Aljo Model 281 TrailRider, Aljo Model 286 TrailRider, Aljo Model 302 TrailRider, Aljo Model 302 TrailRider. Brown's Recreation Center stocks these Toy Hauler Fifth Wheels by Skyline: Aljo TrailRider Model 263 Way -Lite, Aljo TrailRider Model 89, Aljo TrailRider Model 337, Aljo TrailRider Model 385. Brown's Recreational Center is happy to custom order any Skyline Aljo or Nomad Product at the same discount price.